“Back pain accounts for more than 264 million lost work days in one year.” It is an all too common and costly ailment. Back pain can prevent you from going to work, keeping up with your children, and participating in activities that you enjoy. To keep your back pain in check, attempt these 10 techniques to avoid lower back pain as much as possible. Learn and practice proper posture. Slouching or hunching over a desk all day can strain your muscles and joints causing unnecessary pain. Practicing good posture will help keep your spine strong and stable. Focus on your core muscles. In order to maintain good posture, you need strong abdominal muscles as well as a strong spine. Exercises that focus on your core can help you develop abdominal strength and keep your posture and spine straight and strong. Lift with care. We are told to bend with our knees for good reason. One of the quickest ways to trigger lower back pain is to lift a heavy object without the proper body mechanics. When lifting an item, you should stand with your feet a fair distance apart to give yourself a sturdy base. Then, using your legs to lower yourself, pick up the object, tighten your stomach muscles and use your legs to push yourself back up. Do not bend forward and do not twist your back while lifting. As you age, your joints and ligaments become less flexible and proper positioning becomes even more important to avoid injury. Exercise regularly. Overall, maintaining good physical health can keep your body balanced and strong. It can also help you maintain a healthy weight, which prevents unnecessary strain. Sustained and consistent exercise will help keep all of your muscles healthy and help prevent pain and injury. Eat well. Proper nutrition is critical for bone and muscle health. For instance, if you are calcium deficient, your body may divert calcium from your bones causing them to become brittle, less dense and more prone to injury. Eating well and taking doctor approved supplements can help ensure your body has all the nutrients it needs. Stretch. This seems like simple advice but too few people take the time to stretch properly. Stretching correctly can help improve hip and hamstring flexibility and alleviate lower back pain. 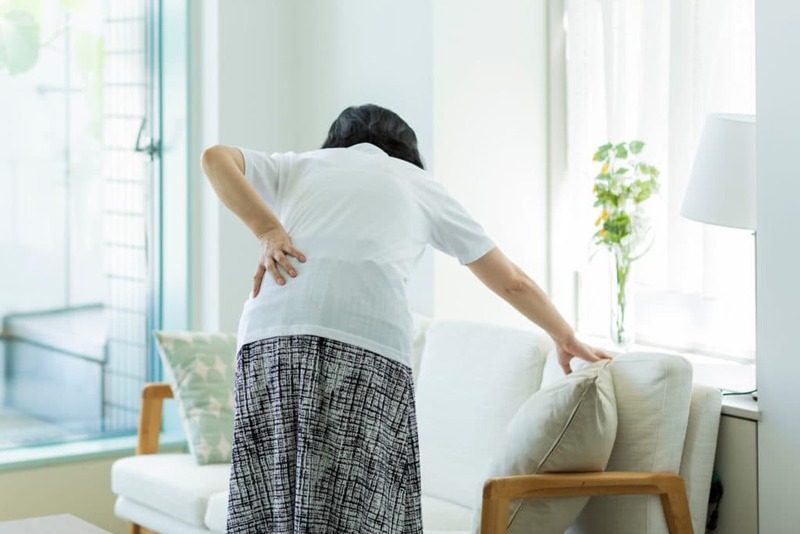 Depending on the location of your pain and any other injuries you may have previously sustained, you may need to work with a physical therapist to determine the best stretches and exercises for your body. Seek medical screening. If there is an underlying issue causing your pain such as arthritis, degenerative disc disease, osteoporosis or a ruptured disc, a medical screening will help your medical provider identify and treat the issue properly. If your pain does not resolve itself within a couple of days, seek medical attention. Quit smoking. Smoking affects the way your brain processes pain and slows down circulation throughout your body. This can restrict the flow of nutrients to your spine. Improving your back pain is just one benefit of being a nonsmoker. Adjust your sleeping position. Sleeping on your stomach can be hard on your back. If possible, try sleeping on your side. If you aren’t a side sleeper, try placing a pillow under your legs and/or back. Make sure your bed and pillows are supportive so your body is correctly aligned while you sleep. If you wake up with back pain, your sleeping position may be the culprit. Watch your accessories. Bulky purses, wallets, backpacks and briefcases can all shift your center of balance and disrupt your posture creating back pain. Fostering healthy habits and paying attention to your lifestyle choices can make a big difference in your physical health. However, some conditions cannot be resolved without medical attention. There’s no reason you should endure pain day after day. If you find yourself suffering from persistent or unbearable lower back pain, call our office today. We will work with you to identify the root cause of your pain and implement a treatment plan that brings you relief. Working together, we can find the best treatment possible for your specific needs.